But what about the turkeys? All across the country, Thanksgiving has been a household tradition that has brought joy and thankfulness since the foundation of America. This holiday is an exciting time for families as they gather with good tidings as the fall weather sets in full swing. Family members gather for the recreating of the first meal between the Pilgrims and the Native Americans in the 17th century and share the Thanksgiving staple, the turkey. The tender meat makes for a great meal where we can give thanks for the provisions in which we are so lucky to be able to enjoy. There is a question, however, that haunts the minds of the people that give thanks on this holiday. This question causes us to look deep into ourselves and question the very foundation of our own morals as well as the morals that this country was formed upon. Clearly, these beings does not carry the same positive connotations of Thanksgiving that we are so accustomed to as 46 million turkeys are ruthlessly slaughtered every year for the sole purpose of having an appetizing meal with our families. This question has floated under the radar for thousands of years now and even though we have gotten away with it in the past a good number of times, no longer will the United States be able to commit such heinous crimes and not have to face the consequences. Not only have we killed millions of turkeys, we have driven them out of their native land, we have stomped all over their breeding ground, and taken their children. Making the entire situation worse, they were here before any of us ever got here. It just isn’t our right and it never has been. Now, every year we are stuck in this bloody cycle where we barbarically kill turkeys for our own enjoyment. While just about everyone agrees that turkey is a delightful meat, it does not grant us the right to act in such horrible ways. 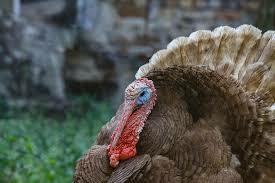 Perhaps the power-hungry politicians thought differently, considering the turkey of less stature than any other animal. I think the worst part of this turkey injustice is the fact that the government still does not even feel bad for the families of these turkeys that they have torn apart throughout the years of the holiday. They think just because they pardon a single turkey each year that they are off the hook completely. Of course, they only pardon the turkey that has assimilated into the American culture. Those who still adopt their own cultural practices are either killed for food or put in government-allotted land where they grow up with other turkeys and suffer even more injustices for doing nothing wrong. While the peak of suffering occurred in the late 19th Century, the effects are still seen in everyday American life and the government still has not faced the consequences of these crimes. So as the season for thankfulness is in full swing, it is time we look deep into ourselves and our very own history and ask: what about the turkeys?